Chairman of Azersu Open Joint Stock Company Gorkhmaz Huseynov informed the head of state about the work carried out under the project on the reconstruction of the drinking water supply and sewerage systems of the city of Astara. 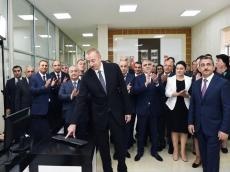 The implementation of the project started in 2015 under the State Program on socio-economic development of districts signed by President Ilham Aliyev. The project is designed to improve drinking water and sewerage services for 28,500 people in the city of Astara. The President met with representatives of the general public of Astara city.